Network-based representation has quickly emerged as the norm in representing rich interactions in complex systems. For example, given the trajectories of ships, a global shipping network can be constructed by assigning port-to-port traffic as edge weights. However, the conventional first-order (Markov property) networks thus built captures only pairwise shipping traffic between ports, disregarding the fact that ship movements can depend on multiple previous steps. The loss of information when representing raw data as networks can lead to inaccurate results in the downstream network analyses. In this talk I will introduce the Higher-order Network (HON), which remedies the gap between big data and the network representation by embedding higher-order dependencies in the network. I will show how existing network algorithms including clustering, ranking, and anomaly detection can be directly used on HON without modification, and influence observations in interdisciplinary applications such as modeling global shipping and web user browsing behavior. 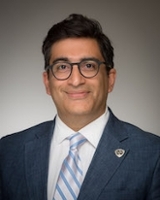 Nitesh Chawla is the Frank M. Freimann Professor of Computer Science and Engineering, and director of the research center on network and data sciences (iCeNSA) at the University of Notre Dame. He started his tenure-track assistant professor career at Notre Dame in 2007, and advanced from assistant professor to a chaired full professor position in 2016. He is the recipient of the 2015 IEEE CIS Outstanding Early Career Award; the IBM Watson Faculty Award, the IBM Big Data and Analytics Faculty Award, National Academy of Engineering New Faculty Fellowship, Outstanding Teaching Award (twice), Rodney F. Ganey Award, and the 1st Source Bank Technology Commercialization Award. His papers have received several outstanding paper nominations and awards. In addition, his students are also recipient of several honors, such as the Honorable Mention for Outstanding Dissertation Award at KDD’17, and second prize for student research at Grace Hopper Conference'17. He is a Fellow of the Reilly Center for Science, Technology, and Values; Fellow of the Institute of Asia and Asian Studies; and Fellow of the Kroc Institute for International Peace Studies at Notre Dame. He is the founder of Aunalytics, a data science software and solutions company.